Highlight the quality of your constructions by integrating a useful product for your customers. The Ewattch energy manager does much more than simply comply with RT2012! It goes much further by offering functionalities that are a real plus for the user: metering of water, gas, sending reports by email, water leak detection, VMC defects…..
Because kWh does not tell you how much your bill will be, the integrated dashboard displays amounts in Euros for electricity, water and gas. You always know your energy consumption, you do not wait to find out how much you owe on your energy bill at the last moment! 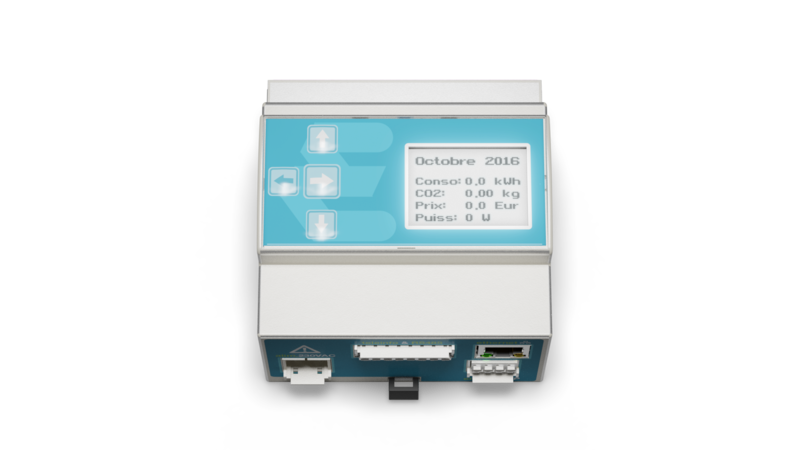 Thanks to its wireless connectivity, the EWATTCH monitor is able to communicate with various sensors: temperature, humidity, CO2, VOC, SQUID … and soon with several actuators to control your installation. Whether in EnOcean for sensor diversity or wireless MBUS for long range, the monitor offers you a real opportunity to move towards future standards or future applications. Want to use your current system to exploit your data? EWATTCH gives you access to its API so you can retrieve all the data stored in the monitor. And because you may want to create your own dashboard, EWATTCH has made its monitor compatible with the open source dashboard: OPENCMS. Configure the device with our intuitive software. You can access your energy dashboard in minutes using your smartphone, tablet and computer! Especially suitable for large commercial buildings.